Although significant, dissenters, both individuals and small groups, re­ceive disproportionate attention compared to an overwhelmingly im­portant but neglected theme: the perpetrators’ communities. In Hitler’s Willing Executioners, I wrote about the Holocaust’s perpetrators in a manner that restored their humanity. I treated them fully as human be­ings having views about their deeds and making decisions about how to act, not as abstractions wrested from their lives’ real social contexts but, as they actually were, embedded in their social relations. Such an approach was at the time absent, even stridently opposed. The German perpetrators of the Holocaust and of eliminationist and extermina­tionist assaults on Poles, Russians, Sinti, Roma, and other targeted peo­ples operated within broader communities. They undertook their deeds often over long periods, always with considerable time on their hands to reflect. They had social lives. Wives and girlfriends accompanied many of them (many of whom also became perpetrators). The perpe­trators went to church, played sports, even organized athletic competi­tions. They attended cultural events, went to movies, and had parties. They wrote revealing letters to loved ones and went home on furlough. Most of all they talked—while on duty, while off duty, while eating meals and driving places, among themselves and others, discussing the days’ events, their historic deeds, and more. Those many German per­petrators carrying out their brutal eliminationist tasks in Germany it­self, especially in the camps densely blanketing the country, often lived at home. After a day of mistreating and brutalizing, and even killing victims, they returned to their families, had dinner, played with their children. They spent time with friends, also went to church, and did all the social and communal things, including talking about work, that people do. What is true about the German perpetrators’ rich social and communal lives is also obviously true, a commonplace, about other mass eliminations’ perpetrators. Yet if you pretend people killing, expelling, or brutalizing others are atomized individuals, are under authority’s hammer or intense social psychological pressure with no capacity to think, or are bureaucratic abstractions instead of real human beings; if you toss around mind-deadening phrases such as “banality of evil” or “obedience to author­ity” or “group pressure,” or treat mass murder as if an artificial social psychological environment, such as the Zimbardo Experiment of a tiny number of people (twenty-four) for a short time (six days) with no ex­perimental controls to speak of, so it was not really an “experiment” in a scientific or social scientific sense, is a guide to its perpetrators’ real­ity and existences as people with families, friends, and communal lives; or if you postulate these fictive and dehumanizing reductions of the perpetrators as a tautological account of their actions and, more broadly, as a way of conceiving and discussing them, then there is no reason, as we have seen, to investigate how they come to hold their views about the world and their victims (or even what those views are). There is also no reason to examine the perpetrators in their multiple communal contexts while committing their eliminationist acts or to ex­amine their social relations, ways of living, and activities. The hard­headed questions we ask to ascertain the perpetrators’ motives and their sources, and the bystanders’ attitudes and their sources, also pro­vide answers that can be built upon to explore the perpetrators’ rela­tionship to the bystanders helping to form the communal contexts of the perpetrators’ eliminationist actions and lives. Clothing of the victims, Nyamata Genocide Memorial, Bugesera District, Rwanda, April 2008. The first evening, coming home from the massacre in the church, our welcome was very well put together by the organizers. We all met up back on the soccer field. Guns were shooting in the air, whistles and suchlike musical instruments were sounding. The perpetrators of mass annihilation and elimination know they exist in supportive eliminationist milieus; they themselves witness the open communal expressions of support. 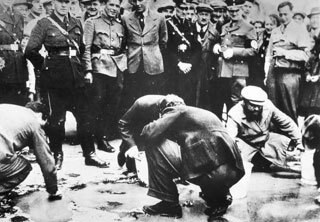 The eliminationist campaign against the Jews was immensely popular among Germans not only during the pre-exterminationist phase of the 1930s, as everyone in Germany knew—the regime and ordinary Germans alike openly celebrated it with fanfare—but also during the mass-murderous phase starting in 1941. To see how this knowledge of the Germans’ broad base of support for the Jews’ elimination was acted upon by the regime, shared by Ger­man bystanders, and communicated by the perpetrators to their loved ones, we need merely to look to Europe’s largest concentration of Jews, the Warsaw Ghetto camp in the heart of Poland’s capital. Did the Ger­man leadership try to hide half a million Jews’ inhuman conditions? Not at all. In the midst of the Germans’ all-out extermination of the Jews, the German Labor Front’s recreational organization for German workers, called Strength Through Joy, organized coach tours of the ghetto where the Germans were starving the Jews to death on fewer than four hundred calories a day. Every day large coaches come to the ghetto; they take soldiers through as if it was a zoo. It is the thing to do to provoke the wild an­imals. Often soldiers strike out at passers-by with long whips as they drive through. They go to the cemetery where they take pictures. They compel the families of the dead and the rabbis to interrupt the funeral and to pose in front of their lenses. They set up genre pic­tures (old Jew above the corpse of a young girl). 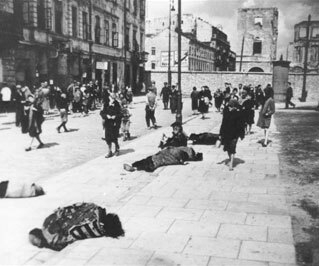 Pedestrians in the Warsaw Ghetto walk past corpses lying on the pavement on Rynkowa Street, near the ghetto wall, Warsaw, Poland, 1940-1941. To develop a systematic and comparative understanding of the per­petrators’ social existences and communal lives, and how their social embeddedness affects or reflects treatment of their victims, we need to examine the perpetrators’ various communities and social relations. We must replace the fictitious general image of the frightened, atomized, isolated killer (said to exist under a regime’s draconian authority, or under group pressure), with a realistic account of the perpetrators’ so­cial, psychological, and moral communal existences. These vary sub­stantially across eliminationist assaults, and even within given eliminationist assaults when a particular eliminationist program cov­ers large territories or long periods. The framework for the needed extensive empirical inquiry into the perpetrators’ communal lives in individual eliminations and then com­paratively distinguishes five principal kinds of communities that form the social context for the perpetrators’ actions. First, the community of the perpetrators themselves, including but not restricted to men serv­ing in the same camp, mobile killing squad, death march, and other eliminationist institutions. Second, the broader nonperpetrator com­munities in which they are embedded while eliminating their victims. These consist of local cities and towns where the perpetrators are sta­tioned, whether at home or abroad, and the social communities and lives their governments and institutions at times create for them. Third, their home communities, to which most of them will return, of family, friends, neighbors, acquaintances, and fellow members of their local national, ethnic, or communal groups. Fourth, related to the third, the more abstract—though given the power of nationalism and ethnic or religious group membership to move people, hardly trivial—larger na­tional, ethnic, religious, or political communities. Fifth, far more distant and less relevant for most perpetrators, the international community, the rest of humanity. 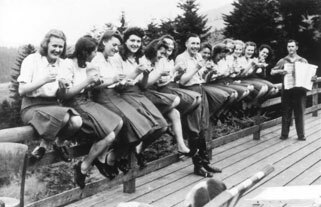 The perpetrators’ community: SS female auxiliaries and Karl Höcker, the adjutant to Auschwitz’s camp commander, eat bowls of blueberries to accordion music, Solahütte retreat near Auschwitz, Poland, 1944. The perpetrators live in all or most of these communities while they kill and eliminate their victims. Their physical and social existences are continuous in some, episodic in others, and nonexistent or almost so in others. But in them all, though obviously varying substantially, the perpetrators are situated socially, psychologically, or morally, and even in those they do not physically inhabit while acting as perpetra­tors, they know they eventually will have some relationship of moral accountability, psychological influence, or social or political conse­quence. This knowledge is relevant, can be powerful, and should not continue to be discounted. Still, whatever is generally true about the per­petrators’ various communities, including their general supportiveness, more can be said about each of them, and their interconnectedness. Working in eliminationist institutions can be utterly normal (or at least can become utterly normal after a perpetrator’s initial participa­tion in an eliminationist operation) when the need to carry out the elim­inationist assault seems unquestionable. Even among perpetrators viewing the victims as sufficiently noxious or threatening to warrant or necessitate their elimination, including lethally, some may doubt such actions’ wisdom or morality. In such circumstances, a perpetra­tor’s comrades’ validation of the violence, or the knowledge that he op­erates under the state’s aegis, or as the nation’s or the perpetrators’ ethnic or religious group’s representative and guardian, can help quell a perpetrator’s lingering doubts. The eliminationist regime’s character, and the specific eliminationist institution’s character, can affect the per­petrators’ understanding of their deeds and their lives’ quality while killing, expelling, torturing, and immiserating their victims. Some regimes and killing institutions, such as the Germans’, were organized and hierarchical, and relatively lax and understanding toward the per­petrators. They were also characterized by considerable off-duty com­radeship and conviviality. 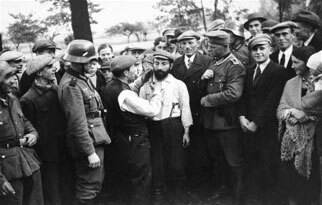 The local community: A group of German soldiers and civilians looks on as a Jewish man is forced to cut the beard of another in Tomaszow Mazowiecki, Poland, September–October 1939. The second kind of community, the communities physically encom­passing or abutting the perpetrators while at their eliminationist tasks, forms the perpetrators’ immediate social context. These communities vary enormously. If the perpetrators are killing in their own country but not near home, they live as visitors or temporary residents. If in a con­quered or colonial area, their government or they and their compatriots construct a local perpetrator community (the nearby victim peoples usu­ally being communally irrelevant). These can vary from settler commu­nities, as the British had in Kenya, the Japanese founded in Korea, the Germans created in Poland, and the Chinese established in Tibet, to im­perial garrison communities with impromptu human and institutional infrastructural support, as the Japanese and the Germans had in some of their conquered areas. Everyone in such communities knows about the perpetrators’ deeds. They see them. They mingle with the perpetrators. They work with them. They often revel in the perpetrators’ deeds. They service and supply them, and collaborate with them in nonelimination­ist activities. Such people are not formally perpetrators (some do cross the line), yet they implicate themselves in the deeds, or they so intimately rub shoulders with the perpetrators that they belong to the perpetrator community. Everything suggests they are consensual communities. The third community, consisting of the perpetrators’ families, neigh­borhoods, and towns, powerfully exists for all mass annihilations and eliminations’ perpetrators, though differently depending on where the perpetrators work their violence. Perpetrators, usually sooner than later, visit or return to their families and home communities, to loved ones, friends, and others, who often, probably usually, know at least the ba­sics of the perpetrators’ deeds. The perpetrators must inevitably con­sider how these people will judge their deeds. In many mass eliminations perpetrators operate in their home environs. As they brutalize, expel, and kill people, they, embedded in those communities day and night, do not have to wonder what their families and communities will someday say. This was true of those in Turkey attacking Armenian death marches as they trudged by impromptu perpetrators’ towns, of the enormous number of Germans guarding or servicing camps in their own cities, towns, and neighborhoods, of Indonesians slaughtering communists, of Serbs in Bosnia, Tutsi in Burundi, Hutu in Rwanda, and more. Beyond their local communities is the larger reference group of the nation, the people, the political movement, the tribe, or the religious group, in whose name perpetrators act. Perpetrators kill, expel, and in­carcerate their victims to secure the future for themselves and their fam­ilies by reconstituting society. As we repeatedly see, they also understand themselves to be acting for their larger communities. What will be their personal legacies to their people? How do they expect their people to see and judge them, to thank and celebrate or to shun and punish them? Such considerations unquestioningly affect many perpe­trators, potentially all of them. Finally, there is the international community or humanity—the real human beings, not the abstraction of humanity moving many commu­nists, or the Germans’ and the Japanese’s restricted racist conceptions of humanity, consigning peoples to subhumanity. Perpetrators facing their victims likely do not think much about the international community. Yet, as much testimony indicates, the perpetrators are aware of a larger world, which they usually understand will condemn their actual and prospective eliminationist violence. In the past several decades, the spread of telecommunications has made perpetrators increasingly aware their acts will receive international scrutiny. Nevertheless, most perpe­trators appear but tenuously connected psychologically to these distant and rather abstract community considerations. After all, when perpe­trators face the “work of demons who wage their battle against us” or other putatively threatening or problematic subhumans, people across an ocean, or over a border or two, must seem irrelevant. Political lead­ers initiating and overseeing eliminationist assaults, however, are acutely conscious (if often ultimately dismissive) of the international commu­nity. The critical issue, taken up in Chapter 11, is how to vastly increase the international community’s psychological and moral centrality, and relative weight among the perpetrators’ various more immediate com­munities, for actual or prospective perpetrators—from the man on the ground, gun or machete in his hand, to his immediate commanders, to those running eliminationist institutions, and especially to the political leaders unleashing and orchestrating the eliminationist assaults. Few, if any, perpetrators likely self-consciously disaggregate their embeddedness in various communities, or regularly assess how each community and its many members (even leaving aside the distant inter­national community) judge or will judge their deeds and ultimately them. For many, especially those working at home, no difference exists among some of their communities. For some, such as the Indonesians slaughtering communists and, even more so, Serbs in Bosnia and Hutu in Rwanda, the communities of killers, of immediate locale, of home, and even of the nation collapse into an integrated mass-murderous and eliminationist consensual community. In addition to these instances, the judgment of communities, except the international one, is obviously gen­erally a non-issue for killers, expellers, and guards. The perpetrators move in overlapping or intersecting communities approving their deeds, so acute moral doubt and existential discomfort do not arise. A striking feature of prejudices and hatreds, of the dehumanizing and demonizing conceptions one group’s members have for another’s, is their intellectual and social leveling—within communities and, what­ever the specific beliefs’ differences, across societies and civilizations. In given eliminationist communities, university professors and high school–educated janitors share common murderous views about tar­geted people. The same talk animates the lecture hall and the beer hall, the principal difference being the little separating highfalutin nonsense from plain nonsense. The “people of poets and thinkers,” as the Ger­mans, Europe’s most highly educated people, liked to call themselves, were no different from illiterate Hutu farmers (Rwanda’s adult liter­acy rate, at around 50 percent, was among the world’s lowest). Intel­lectuals, lawyers, teachers, doctors, and clergy—the opinion leaders and in some cases, especially the clergy, moral leaders—validate the elimi­nationist beliefs and acts of their societies’ ordinary members and prospectively further sustain the perpetrators’ confidence in their peo­ple’s solidarity. We have already explored how Serbian writers and in­tellectuals, including the country’s most influential body of thinkers, the Serbian Academy of Arts and Sciences, laid down the common ideational foundation and even provided the political leadership for the Serbs’ eliminationist assaults. German intellectuals, doctors, jurists, teachers, clergy critically contributed to spreading eliminationist anti­semitism and other racist and dehumanizing views in Germany before and during the Nazi period. Shelves of books, including some of the very early scholarly works on Nazism and the Holocaust, bear such ti­tles as Hitler’s Professors, The Third Reich and Its Thinkers, The Nazi Doctors, Hitler’s Justice, Revolutionary Anti-Semitism in Germany from Kant to Wagner.29 Such socially and culturally crucial people analo­gously prepared the ground for our time’s other mass slaughters and eliminations, including those done in the name of Marx and the prom­ised land he and his intellectual epigones promised. Vladimir Lenin, Leon Trotsky, and others, who laid the foundation for and initiated the communists’ long-term eliminationist assault on many portions of So­viet society, were extremely intelligent men and authors of learned Marxist works. Pol Pot and other Khmer Rouge leaders were also rel­atively highly educated, having imbibed their foundational Marxism in Paris. In Rwanda, intellectuals prepared Hutu for what was to come, as Innocent Rwililiza, a Tutsi survivor, explains: “Genocide is not really a matter of poverty or lack of education. . . . 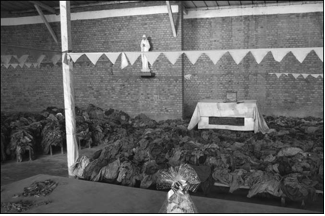 In 1959 the Hutu relent­lessly robbed, killed, and drove away Tutsi, but they never for a single day imagined exterminating them. It is the intellectuals who emanci­pated them, by planting the idea of genocide in their heads and sweep­ing away their hesitations.”30 After the fact, some perpetrators, finally seeing their deeds through the outside world’s condemning eyes, reflect on how their intellectuals, elites, and clergy led them astray. Intellectuals, doctors, teachers, lawyers, and clergy are also part of their societies. They too participate in the hateful discourses, in which they are no less, and often more, embedded than the communities’ other members who also create and sustain them. They too act or support the acts that follow on their logic. No significant part of the German elites thought the Jews wholly innocent and therefore dissented from the fundamentals of the eliminationist project against the Jews (though some would have preferred a nonlethal eliminationist solution). Even the leading German resistance groups to Hitler were profoundly anti­semitic, which informed their future plans for Jews. One of the resis­tance’s central documents, prepared by leading Protestant theologians and university professors, contained an appendix called “Proposals for a Solution to the Jewish Problem in Germany,” which, referring to Jews, stated that a post-Nazi Germany would be justified in taking steps “to ward off the calamitous influence of one race on the national community.” Yet thanks to the highly effective exterminationist pro­gram, they could perhaps tolerate Jews in Germany, because “the num­ber of Jews surviving and returning to Germany will not be so large that they could still be regarded as a danger to the German nation.”31 German elites were active, willing, and leading participants in the an­nihilationist assault on the Jews and in the Germans’ other elimina­tionist projects. Einsatzgruppen leaders slaughtering Jews in the Soviet Union were academically trained, as did the principal author and oth­ers working on the murderous and eliminationist anti-Slav General Plan for the East. Church leaders and clergy the world over, from Turkey, to Germany, to Croatia, to Indonesia, to Serbia, to Rwanda, and to the Political Islamic religious leaders and clerics in different countries, have actively and tacitly blessed mass murder. (Where, we should ask, have religious leaders opposed their countrymen’s or clansmen’s elimina­tionist assaults? If they had, such as the Bulgarian Orthodox Church leaders who were instrumental in preventing the Bulgarian Jews’ de­portation, or Pastor André Trocmé, who led an effort in Le Chambon­sur-Lignon in France that saved five thousand Jews, we would know and they would have prevented countless deaths. Yet we know of so few.) Local dignitaries often organized and led the Bosnian Serbs’ para­military or local killing institutions. In Rwanda, the local intellectuals were in the thick of the mass murder. Jean-Baptiste Munyankore, a Tutsi teacher and survivor, explains: “The principal and the inspector of schools in my district participated in the killings with nail-studded clubs. . . . A priest, the burgomaster, the subprefect, a doctor—they all killed with their own hands. . . . These well educated people were calm, and they rolled up their sleeves to get a good grip on their machetes.”32 Well-educated people, leading professionals of one society after the next, together with those looking up to them, have closed ranks in a community of murderous consent. After eliminationist assaults, after the massive death toll and the vast suffering the perpetrators have inflicted become clear, in country after country, in town after town, the perpetrators return to their people, whose names they have blackened in the world’s eyes, but evidently not in their own. In every mass murder and elimination’s aftermath, the broader community in whose name the perpetrators acted has not socially or politically rejected, let alone punished, the perpetrators. (Punishment has occasionally been meted out by those defeating per­petrators or those replacing the perpetrating regime.) The perpetrators have not been turned into outcasts, not shunned, not treated in any way as a community would ordinarily treat murderers, let alone mass murderers in their midst. It did not happen in Turkey, in Germany, in Indonesia, in Serbia or among Serbs in Bosnia—who after the elimina­tionist assault continued to celebrate the Bosnian Serbian elimination­ist architects Radovan Karadžić and Ratko Mladić as heroes—in Burundi, in Rwanda among the Hutu themselves. Communities wel­come the perpetrators back and, when necessary and feasible, have pas­sionately risen to defend them. The social and communal solidarity the perpetrators find in the posteliminationist era merely continues the sol­idarity they experienced while assaulting their victims. 18. Quoted in Jean Hatzfeld, Machete Season: The Killers in Rwanda Speak (New York: Farrar, Straus and Giroux, 2005), p. 96. 19. John Hughes, Indonesian Upheaval (New York: David McKay, 1967), p. 175. 20. Alisa MuratOauš, author interview, Sarajevo, Bosnia and Herzego vina, July 12, 2008. 21. Hatzfeld, Machete Season, p. 9. 23. BA Koblenz, ZSg. 101 Sammlung Brammer zur Pressepolitik des NSStaates, no. 41, pp. 55–57. 24. Quoted in Alf Lüdtke, “The Appeal of Exterminating ‘Others’: German Workers and the Limits of Resistance,” in Michael Geyer and John W. Boyer, eds., Resistance Against the Third Reich, 1933–1990 (Chicago: University of Chicago Press, 1994), p. 73. 26. Hatzfeld, Machete Season, pp. 71 and 219. 27. Daniel Jonah Goldhagen, Hitler’s Willing Executioners: Ordinary Germans and the Holocaust (New York: Knopf, 1996), especially pp. 450–454. 28. Hatzfeld, Machete Season, pp. 219 and 170. Press, 1991); and Paul Lawrence Rose, Revolutionary Antisemitism in Germany from Kant to Wagner (Princeton, NJ: Princeton University Press, 1990). 30. Quoted in Hatzfeld, Machete Season, pp. 153–154. 31. Quoted in Goldhagen, Hitler’s Willing Executioners, p. 115. 32. Quoted in Hatzfeld, Machete Season, p. 68.